"LOVE YOURSELF" Can't find anything to put in a big bag in your life? Then take a healing series of thirsty bears to experience everyday beauty. Not only can you put in change, banknotes, all kinds of cards, car keys, home keys, headphones, charging cords, and anything else you want to stuff into small bags. 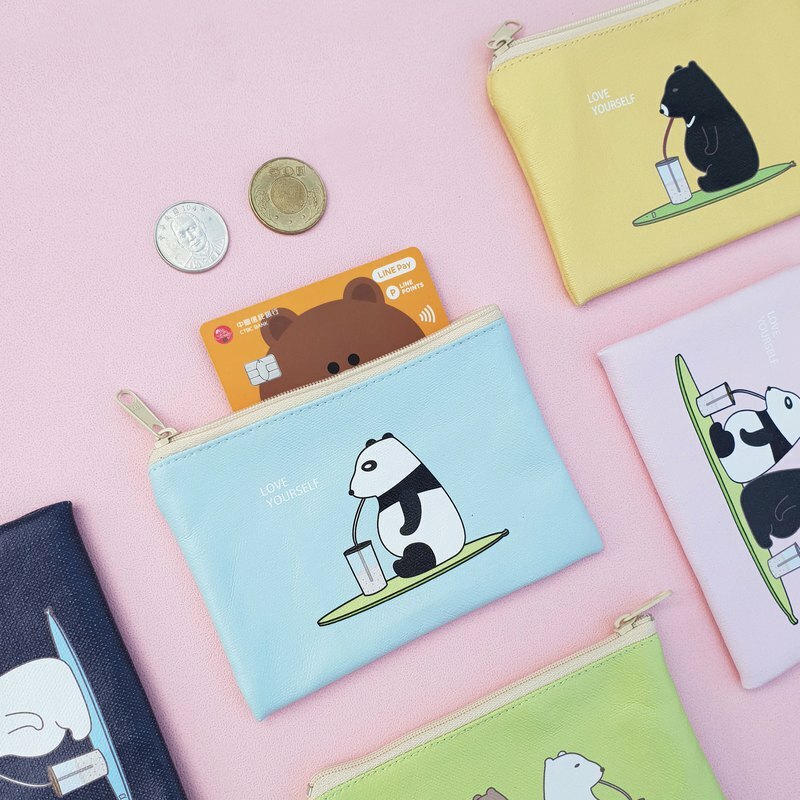 Illustrator: yunchiichi Title: Thirsty bear :: Thirsty and thirsty bear series wallet (thirsty thirsty polar bear / brown bear / panda bear / black bear / panda bear & black bear / brown bear & polar bear) Product Size: Width 13.5 cm high and 9.5 cm wide https://farm1.staticflickr.com/944/41528760324_4098eae73a_z.jpg https://farm1.staticflickr.com/958/27379788197_b4b7a123fb_z.jpg ▲ thirsty polar bear https://farm1.staticflickr.com/959/42204022752_cab052788d_z.jpg ▲ thirsty panda bear https://farm1.staticflickr.com/978/42250243001_5fb110c965_z.jpg ▲ thirsty and thirsty black bear https://farm1.staticflickr.com/909/27379739457_2cb2c36f7f_z.jpg ▲ thirsty and thirsty brown bear https://farm1.staticflickr.com/979/42250262641_10b35ba363_z.jpg ▲ Thirsty and thirsty brown bears & polar bears https://farm1.staticflickr.com/959/41528705634_ab06a82911_z.jpg ▲ Thirsty Cat Bear & Black Bear https://farm1.staticflickr.com/829/28377281588_cbf3144eb7_b.jpg Cleaning method: Wipe gently with a wet wipe to remove surface stains Material: Use hand-sewn canvas for sewing. --- Precautions: :: The color of the product will vary depending on the computer screen. :: Within plus or minus 1 cm in size is the normal range and does not belong to 瑕疵 merchandise. Origin / manufacturing methods: Taiwan design printing, hand-sewn.